Shirts With Random Triangles: Missouri QB Maty Mauk Indefinitely Suspended While School Investigates Video Of Alleged Substance Abuse. 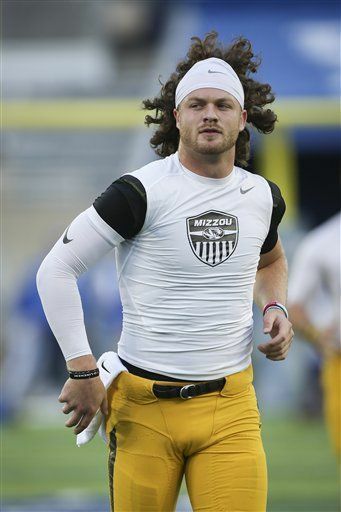 Missouri QB Maty Mauk Indefinitely Suspended While School Investigates Video Of Alleged Substance Abuse. Maty Mauk. Image via stltoday.com. There's more trouble for the University of Missouri football program. The school placed quarterback Maty Mauk on indefinite suspension Monday night while it investigates a video allegedly showing him snorting a controlled substance. The nine-second video allegedly documents a person identified as Mauk snorting what ESPN gingerly described as "a white, powder-like substance." Deadspin went further, calling the substance as "a line of something, allegedly cocaine." Missouri head coach Barry Odom and athletic director Mack Rhoads issued a joint statement regarding the incident. This marks the third time in six months that Mauk has been suspended. Former Missouri head coach Gary Pinkel suspended Mauk on September 29 of last for the ever-vague "violation of team rules." Mark was reinstated on Oct. 25, only to be suspended again on Nov. 1 for "disciplinary purposes" following an incident outside a bar in Columbia, Mo.